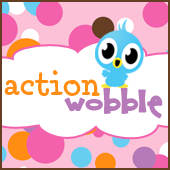 Action Wobbles: Action Wobble: Popcorn Anyone? Its Gloria from Girlia's Cards. I hope your day is going well. Thanks for joining me for another day of inspiration. I just could not resist making this card. It just looks like fun!! I do know that if popcorn had faces I definitely would not be able to eat these cute little faces (lol). Popcorn on a wobble anyone? Wow, this is so adorable, love those cute faces! too cute..where did you get the "Popcorn"? I would like to duplicate your card.